Somewhere I heard the story of Ganesha (sometimes called Ganesh, or Gonesh) and was struck by it. He is one of the five main deities in Hindu religion, though Ganesha himself is acknowledged acrsoss several religions, including Buddhism. He is said to be the Lord of success and destroyer of evils and obstacles. He is also worshipped as the god of education, knowledge, wisdom and wealth. His particular story goes something like this: Shiva was married to the goddess Parvati. Shiva was often way for long periods of time, years even, on goddish business. While he was gone, Parvati wished to bathe, but had no-one to guard the door to her bath. She created Ganesha to guard the door for her (Goddesses can do that, I guess). She gave him strict instructions to let no-one in the door. While she was bathing, Shiva came home, and found his way blocked by the little boy who absolutely would not let him pass. Enraged, Shiva struck off his head. Parvati came out of her bath and freaked out. She, in turn, was very, very unhappy with Shiva. To make it up to her, he offered to bring him back to life, using the head of the first animal he came across who was sleeping with it’s head facing north. He sent his attendants out into the land, and they found an elephant head. Shiva restored life and limb to Ganesha, and made him leader of his troops. As a further boon to Parvati, who was sincerely peeved, Shiva also decreed that people would worship Ganesha before starting a journey or undertaking an adventure. There are several variations on this story, but this is the most popular. I had been toying with the idea to do a piece on Ganesha for some time, in my head. Idly, I had been looking for a picture that I could adapt. A friend who was also into the deity, had some books, which she loaned to me. The traditional image of Ganesha shows him seated on a lotus cushion, resplendant in his clothing and jewelry, with four hands holding, alternately an axe, a coil of rope, his broken tusk, a rosary, a bowl of sweets. One of the books was a children’s book, and I really liked the illustration on the cover. It was quite a bit more simplistic, and I thought I could adapt it well enough for glass. It was a fantastically rewarding piece to do. It took me 10 months to complete, about three of those were months when I didn’t work on him at all. He saw me through my decision to leave my husband, and then leave LA. I spent many, many hours, bent over his form, thinking and pondering what in the hell I was gonna do, as I worked the glass. sometime things became clear, sometimes not. But working on him gave me a refuge when I needed one, and a creative outlet which I think helped me stay positive through that year. Initially, I was going to add many more details, mainly in the form of his jewels; on the crown, on the necklace, around his neck, hanging from wrist and ankle. There were also vines hanging down from the tree, which I was going to recreate. As the piece was almost completed, I laid out the necklaces that I had made, laid the jewels on the crown and necklace… and it felt gaudy and overwhelming. So I left them off. I did use a small blue jewel for his bellybutton. That is also why there is a vertical seem in the upper portion of the sky, that was originally going to be a vine. By the time I decided not to do the vines, everything was soldered and I couldn’t bring myself to break it all apart. 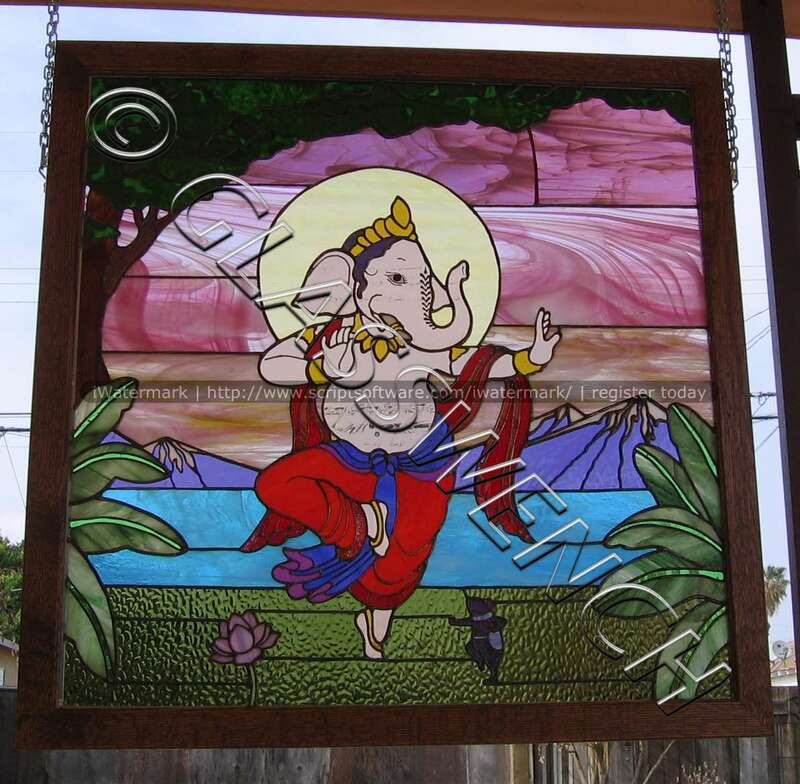 If anyone wants more detail on his story, drop me a note, or do a search on google for Ganesha story. The symbolism is very cool. Okay – I’m hooked. Just marked your site to come back to later. I feel like I need to start from here and read until I get to now. Except I don’t know when this post was published, so I guess I’ll start at the beginning. Just wanted to say hi and tell you that your work is absolutely gorgeous and full of heart. thank you twila, for those sweet words. hope you enjoyed the other posts.